Pitkin County commissioners voted 3-2 Tuesday to oppose the city's renewal of water rights that could lead to the building of dams on Castle and Maroon creeks. Pictured above is Castle Creek from a bridge off Midnight Mine Road 15-A. Pitkin County has joined the opposition against the city’s potential building of dams on Castle and Maroon creeks. County commissioners voted 3-2 at a special hearing Tuesday to challenge the city’s “due diligence” renewal application that was filed Oct. 31 in District 5 Water Court in Glenwood Springs. The vote comes with Dec. 31 looming as the deadline for organizations or individuals to introduce opposition to the city’s application, which the city must renew every six years to demonstrate it is serious about maintaining its conditional rights on the two streams. Representatives from conservation groups Wilderness Workshop of Carbondale and Washington, D.C.-based American Rivers also have said they are considering filing opposition briefs. Since 1971 the city has held a “place in line,” which was granted by the water court, to address its water supply; it secured conditional water rights to build reservoirs on Maroon and Castle creeks in 1965. Those conditional water rights allow the potential for the building a 9,062-acre-foot reservoir in Castle Creek Valley and 4,567-square-foot reservoir in Maroon Creek Valley. The city — anticipating population growth from its current population of nearly 7,000 to 17,500 within 50 years, along with climate change-induced droughts affecting the water supply — has said that reserving the rights to build damns in the two valleys is essential. Both creeks supply Aspen’s drinking water. American Rivers’ Matt Rice, who is director of the nonprofit’s Colorado Basin Program, told The Aspen Times earlier this month that the city would be making a significant mistake by pursuing the course of dams. Using mine tunnels for underground water storage. Promote legislative solutions to water rights use limitations. Evaluate additional water resources, including wells, mines, other water rights, ditches and reusing water for potable use. Engage ditch companies and other agriculture owners/operators in exploring the use of agricultural water to supplement municipal supply. Form collaborative partnerships with trans-basin water diverters to retain additional Western Slope source water. Naturally enrich the watershed to retain water resources longer, including enhancements to landscaping, irrigation efficiencies and in-stream flow. Dave Hornbacher, the city’s director of Utilities and Environmental Initiatives, said he wants community involvement as the city weighs its options. Past renewals have attracted little fanfare. This time, however, it’s different. “There’s just heightened awareness about water and more people being involved in these issues,” Hornbacher said. Commissioners struck a diplomatic tone about challenging the city, mostly agreeing they didn’t like the idea of facing their municipal counterparts in court. Commissioners Steve Child and Rachel Richards voted against the county filing a “statement of opposition,” but were outnumbered by Patti Clapper, George Newman and Michael Owsley. 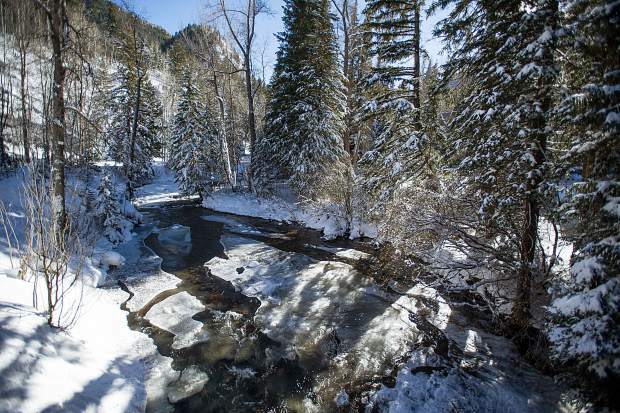 The Pitkin County Healthy Rivers and Streams board initially recommended the opposition.“This board does not support new construction of impoundments of these creeks,” said a Nov. 17-dated letter from the board to county commissioners. Clapper said the county should have a seat at the table with the city in water court; settlement discussions could last for as long as 18 months. Both Child and Richards said they didn’t support the county’s opposition because, in part, the city has proven itself to be environmentally responsible. Richards emphasized she doesn’t support the building of dams but noted the county will have numerous opportunities to discuss the issue of reservoirs, should they come to pass, through the permitting process and addressing the National Environmental Policy Act. Newman and Clapper, however, endorsed opposing the city because the stakes are too high for them not to. “Here we’re looking at most iconic valleys in the country, Castle Creek and Maroon Creek. … There are other ways to preserve the needs for the city, through conservation measures, legislative measure,” Newman said.